I highly recommend Sketch Club for anyone who wants to draw on the go. It has almost as many options a casual digital artist would use on a computer, and it’s intuitive and fun to use. I can pass the time sketching or do full drawings. The best drawing app I’ve come across so far. It’s okay, but the only things that I don’t like about it is how there’s no clipping tool, or how it minimizes the layers you have have when making the canvas bigger. If I want to have a big canvas to work on, I don’t want to only have, like, 10 layers to work with. I have all the best digital art apps when I got this one I stopped using the others. You can share your art and make friends with other artists in this app, you can make a t-shirt straight from the app. there are classes you can take this app dose so much I have been using if for 6 months and still learning. There is nothing you can’t do. You just got to learn how to do it. Here is something I really love about it. You can undo all the way back to the very beginning. I am really not doing it justice with my review. But it is unreal how much stuff it can do. You only pay once and get everything. Not like the other app like sketch, adobe and concepts to name a few, where you have to pay for every add on. I love using this app and I’m always learning something new. I’m fairly intermediate when it comes to digital art, but I’ve been using SketchClub for years now. Put bluntly this app is phenomenal. My only requests would be for a prediction line tool for freehand. I use freehanded drawing with the basic brush a lot for my comics and drawings but my lines look squiggly whenever I trace or stroke the page. I also wonder if could it also be possible for me to send/share layered files to other friends who don’t use the app in some other way besides PSD? My iPhone compresses the files without my intending to, and I can’t seem to figure out a way to do so efficiently. All in all thank you, your app is a godsend for creators who cant get crazy expensive hardware and it being so versatile while being inexpensive is almost too good to be true. Seriously. Thank you guys so much! Okay, I SWEAR I'm not a computer. This app is literally the best drawing app I've gotten, EVER. You can share your drawings with the community, a nice one at that, and even print your drawing or design onto a shirt or hoodie. The layout of the different controls and brushes is very easy to understand, and the customizable patterns are nice, too. Overall, a very good app for artists and anyone who would just like to draw. My opinion that doesn’t matter on the internet. I think sketch club is really good if you want a mix between a drawing app, and a place like deviant art where you share your work. Absolutely the best sketch app out there and an all-around great app for drawing, painting, and designing. Easy to learn and super easy to use. Almost wish the other drawing and design apps were this useful and user-friendly. I’ve written a review of this app before but felt the need to recertify my opinions. I still feel this is the most user friendly and complete of the community drawing programs. It has changed over the years, almost always for the better. The developer is very hands on and in-tune with the needs and expectations of the users. There has been a growing involvement by the younger artist in residence that has displaced some of the more seasoned artist, but that in itself has had little effect on those that have stayed onboard. From the standpoint of the drawing tools and sense of community it simply can’t be beat. Bucket tool? Duplicate layer tool? I’ve had this app for some time on my iPad Pro, and I adore it. I love it for sketching, it’s super relaxing and gives me amazing results. It’s sketching is better than all the other apps I’ve tried (MediBang, ibispaint, procreate, etc. ), however I say sketching. I’m still learning about this app, but I don’t see anything that helps the Bucket tool. The bucket tool leaves white dots against the line, and the only way to remove it is to select what you want to color and expand it by 3+ pixels. I suggest a “expand by pixels” on the bucket tool section. Along with that, what about a duplicate layer tool? You can make an empty layer under the layer you want to duplicate, and merge the top one down, but that’s it. It’s tedious, however it works. Regardless, it’s an amazing app and I totally suggest it. Previously reviewed and it has only improved since I uploaded it in Sept 2013!! The app and community are superior to anything I've found on the market. The continued ability to improve and learn new techniques that can be applied even in traditional format applications (such as canvas and watercolor, pen & ink etc) as well as digital instruction and samples, streams etc really makes this an invaluable tool beyond belief! I use this app on my phone for business to sign documents and on iPad create presentations/brochures etc I love this app and I think you will too!! I’ve been using Sketch Club app for almost seven years now and I still think it’s the best drawing app in the store. I’ve tried the others, and there are good ones, but I always come back to this one. It has all the features I need/want and an online community that is friendly, helpful and supportive. 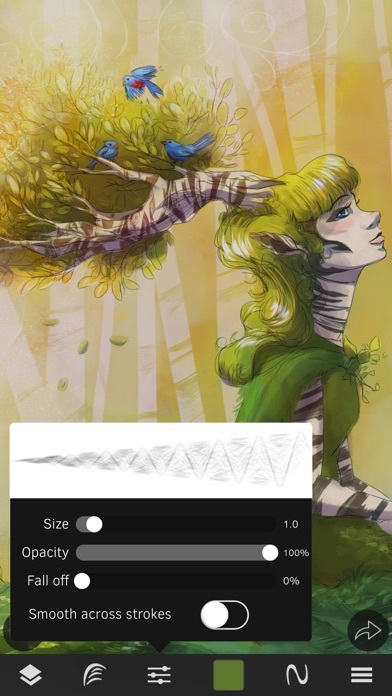 From beginner to seasoned artist, Sketch Club offers all the tools you need to create beautiful art. I whole heartedly recommend this app! Hello sketch club! I was wondering if you could add an animation feature. I really want to try making my own smooth animations but none of the apps I have found make sense to me. I get the layout of where everything is and having this kind of feature might get earn you more money! Please take this into consideration. Thank you! Best app EVER! And I mean this. I've tried them all, I've had them all. I did illustration professionally for a while (although I am really a game designer) and loved working digitally. I was obsessed with the idea of using my iPhone 6S as a portable canvas and the only app out there good enough to make this all seem natural is SKETCHCLUB. The pressure sensitive given by 3D Touch is so good it literally allows you to mimic Wacom Cintiq's functionality allowing for a super CHEAP AND INCREDIBLE alternative to a device that not only is not a phone but also costs generally around as much as an iPhone or even more. No other app has all of the features that you would need to work properly on your PHONE, not Procreate and not ArtStudio (at least not the old once since it didn't have 3D Touch support - not planning on paying 10 dollars for an update no thanks Art Studio 2 or whatever). This is really by far the best painting and editing app I've run into in my several years looking and buying alternatives. It was ironically one of the first ones I've bought, and ever since they added 3D Touch support I just simply stopped looking. It instantly became my go to app. Now, all my illustration happens on my iPhone or iPad and it all happens on SketchClub. Best is, you can always finish the job in photoshop NO PROBLEMO. Best app! Thanks for the fix! Awesomely Brilliant in every way ! This is my go to drawing app. I am not one to write reviews really and normally when they ask I refuse, but this app is underrated and it’s one time fee. Auto desk has gone subscription. SketchClub has so many brushes and backgrounds. It is the best drawing app and I can’t say enough how great it is. You can set it to draw straight lines, squares, and circles. The tracing element is great and the procedural brushes rule. Get SketchClub. 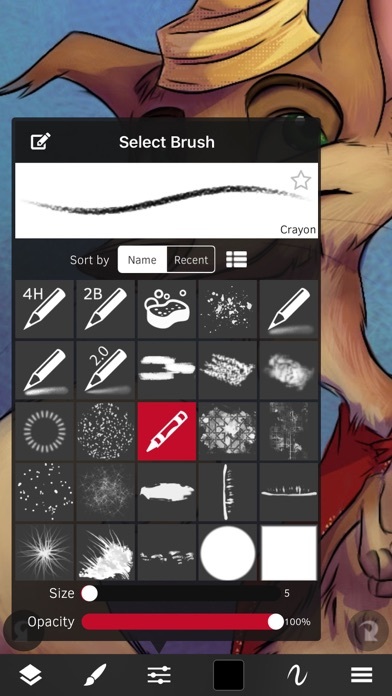 If you like to draw, this is the app for you. This app is really cool and easy to use, you can create beautiful pictures. Have been a member for 8 months now. Gave it some time before I would write a review. If you like to draw or even doodle you will find this app amazing! At first I was a little overwhelmed with its complexity. Gradually the learning curve became much easier allowing me to see the potential of the app. I still am not using all its features but am amazed on how far they have taken digital art! I have found the members to be extremely friendly and courteous, not to mention very talented also! I highly recommend this app. You won’t be disappointed! SketchClub is an amazing tool for drawing professionally or for fun. It makes drawing enjoyable and easy. It is a kind community who give compassionate comments and unwavering support. I highly recommend downloading SketchClub if you have not already. Fantastic app!! Wish they had a ruler or measurement of some sort for technical type drawings. But still a fantastic app!! Today I took out the ipad to the local park and worked outside colorizing images I have previously hand drew. I just started using these iPads and this app is what I need for working on the goal- professionally! The makers rapidly answered a question I had and were thorough explaining what I need to do to complete work on their app. I recommend this app for illustrators! 4/11/2018: Still an incredible app! The powers that created this program are interactive to improving this app. The process of creating a cymx and RJB file using this app works in both print and internet media. Robust but not overwhelming. Well organized, with hidden jewels. Expansive set of tools and fun! I use this app to engage folks who think they can’t draw, turning on mirroring. Sketch Club is by far the best sketch app ever! After this most recent update I can no longer use Sketch Club on my iPad Air 2 running iOS 11.2.6. I already tried to leave a previous review detailing this problem, a rather long review at that. But, it appears that for whatever reason my earlier review was either deleted or never properly posted here, very frustrating, but I digress. So, with this most recent update on my iPad Air 2 running iOS 11.2.6. When I click the icon and attempt to open Sketch Club, I get a notification saying "Migrating Data". But, it never migrates the data I guess, because without fail the app crashes back to my home screen every single time after that message appears. I've never once been able to get into Sketch Club since this most recent update. This is very stressful and frustrating if I'm honest. I thought about trying to delete Sketch Club and then reinstall the application, to see if this corrects my crashing problems. But I'm quite hesitant to do so because I'm pretty that would delete many years worth of my paintings that I have saved up in the app's Gallery. I've used and owned this program since its inception. And while I do generally always export my paintings out of the app in addition to saving them to the Gallery. Well, I cannot be one hundred percent sure that I have exported all of my work. And I would be mortified if I deleted and reinstalled Sketch Club, only to find out that I lost every single painting, sketch, etc, that I had saved over the years in the application. So, before I proceed to undertake that drastic and irreversible measure. I would ask that the developer please look into why the app is consistently and constantly crashing on my iPad Air 2, every single time I open it after this most recent update. I really hope that I can use this wonderful and brilliant program and its community again soon. Thank you if you would look into fixing my problem and God bless. Hello, i’ve been using the app for 7 months now. I absolutely love it! But i have a suggestion that i’ve been thinking about for a while now. can you add the feature where we can create our own color swatches, and share them to the community? and maybe have the ability to give them a name, description, and the ability to download them from other people. that way it could be easier (in a way) to get a certain color if it isn’t in the already made color swatches, so they won’t have to use the color picker, and know the base color if they use a lot of shading/lighting. I also would like it if for the Select Area tool, could there be a option to have pen select? It’s like drawing over the picture, but it selects what you’ve drawn over. A bit different from normal select, where we just circle around it, but i think that this would be a bit easier. Thanks for taking your time and reading! This is a fantastic art app! It allows you to be very precise with its zoom, and has tons of community-made brushes that are great for texture and detail. The one problem with this app is not the drawing part itself, more the community. It seems that most of the time, featured drawings are just reproductions of realistic things. They may look nice, but I wish the featured bar had an array of different styles to show everyone’s different strengths. Other than that, I highly reccomend purchasing this. It’s worth it. SketchClub may very well be THE best drawing and painting app in the store. The capabilities and functionality is seemingly endless. It’s my favorite ;) I love all the brushes and the community!! There’s only 1 thing I can think about that it’s missing..and that is a magic wand select tool. Anyhow, there are many ways to work around this and I think that it shouldn’t be an issue at all to the average sketcher. Also the developers are really considerate of their users and I think that’s awesome!! I have been using this all the time for over 5 years! This app is great and gets even better as more new features are added. There is a lot you can do with this app! Including a few things that I have not seen on other software before. The only thing I would ask for now is an improvement of organizing works in the portfolio. You may only delete sketches one at a time, so especially for people who draw a lot and have a LOT of sketches may find it tedious to delete, so I would suggest a bulk delete/move to folder. 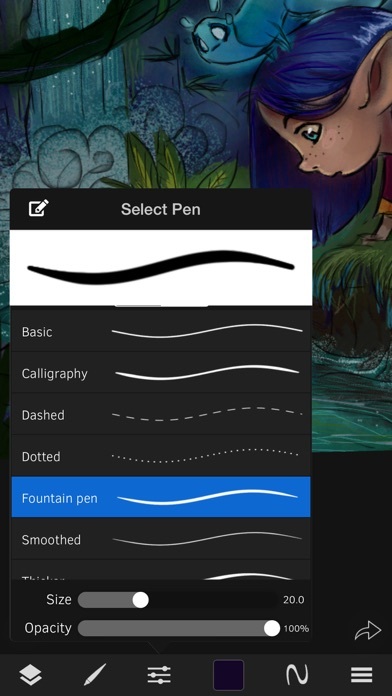 The app is a fabulous collection of drawing tools, with options for many different styles - watercolor, oil, pen & ink, manga, cartooning, etc. In addition, there are options for artists to publicly comment on each other’s work, collaborate together on a sketch, livestream your sketching, and privately message other artists. The app has several “groups” of artists who share a particular interest (e.g., animals, birds) or style (e.g., watercolor, Old Masters). These groups have “challenge” contests around a particular theme, and the prizes include the opportunity to “feature” another artist’s sketch to the whole community. Other competitions are open to the entire community, called “compos”, and winners are selected by popular vote. A powerful app with a kind and supportive community of artists. This is a great app loaded with pro drawing and painting tools in a nice user interface. The Sketch Club community is a very supportive and encouraging place to show off one's work, and I've made some great friends there. This app is superior to anything I've found on the market. The continued ability to improve & learn new techniques that can be applied even in traditional format applications (such as canvas and watercolor, pen & ink etc) as well as digital instruction & streams etc really makes this an invaluable tool beyond belief! I use this app on my phone for business to sign documents & on iPad to create presentations/brochures etc It’s a great App Gift for a hobbyist or any aspiring artist! Out of all the apps I used I mostly used media bang and ibispaintx. I'm glad I bought this because I'm hooked!! I use sketch club mostly now. The community is amazing and the brushes and tools you can use is great! I definitely recommend you buying this. This app is perfect for a beginner in digital art, as there are many people willing to help in the community, plus lessons and tutorials to help you learn. I would also recommend it to those experienced in digital art, as it offers you the opportunity to use an entire library of custom brushes, record your drawing, etc. The best $2.99 you will ever spend. I have heard concerns about the community being "cliquish". Not in my experience at all. I am a regular person, I try to be nice to new people, (we were all new once!) As long as you behave this way, you will be treated accordingly. It's a great place to grow. :) After 3 years and many updates, friends and learning experiences later - everything I said above still applies. THE best art app on the market!! Sketch club it's my go to app I love drawing on this app I love the rich colors , rich lines. I draw caricatures and this app is perfect for it. This is by far the best drawing app I have ever used. 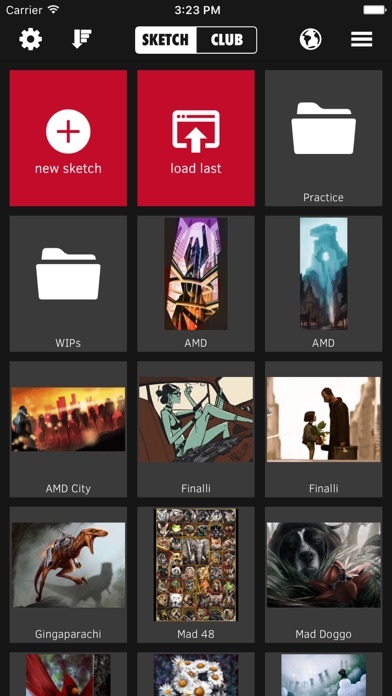 Designed by blackpawn, an artist and programmer, the app works like a dream. The SC artists are talented and supportive. 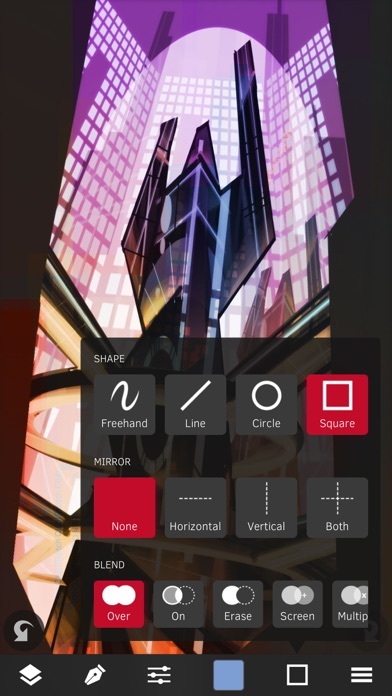 The app is for people of all drawing levels from beginners to professionals. I was welcomed the moment I first posted. You can post drawings or just doodle on your own. Your draws are saved. There are layers and filters as well as some amazing brushes and other awesome custom backgrounds etc. Online tutorials and chat as well as email are available if you need help. I would gladly pay for apps if they were as excellent as SC. I've been using this app for years now, after trying others, I always come back to this one. I've created designs for T-shirts, drawn landscapes, horses, graffitti style art. It has the capability to create any kind of illustration, sketch, etc. and getting around and learning the tools,( lots of them),is not very dificult, just takes a little patience. It's a steal at what you pay for this app as others apps charge more and milk you for any and everything but still can't compare to this. Top notch in every way. Never had any regrets or upsets and the updates are great with improvements added all the time. Powerful app and highly recommended! The most convenient and advanced drawing app for iPad I have used so far. Beats Photoshop and Illustrator in many aspects. Recommend for anyone, especially in graphic design industry. This is not just a drawing and painting app that has many great features, but it’s also an art community. It’s the best I’ve ever used on a mobile device. There are no limits to what you can create in 2D with this app. I look forward to using it more! This app is great for drawing. It has every feature needed to draw and paint. I highly recommend this app to anyone who loves art, it is definitely worth the money. First, this app is phenomenal! There's a variety of different brushes and pens to use and the entire program runs extremely smoothly! The only issue I have is a few minor bugs it just some features that should be in there app but aren't. First is when using the app you have the ability to use a reference image without using an image load, but you can only select colors from the reference on iPads or anything that's not a phone. ( Edit: Oh- nvm, this feature has been added in, I just didn't see it ;3) Second, recently the Streaming audio has been bugging to the point where I can barely hear the person speaking. This is an issue especially since I can't even hear the audio in the first place without doing a million other things to be able to just hear a faint whisper of the streamers voice. (Edit: This problem has been fixed as well) The final thing is that I have Rotation disabled for preferential reasons. Sadly this means I can't turn canvases on their sides. Whatever canvas I use it's always automatically vertical even if it's viewed as horizontal when creating the canvas. You could just say I could turn rotation on but whenever I do it makes the canvas lag and causes nausea whenever I try to turn the screen. These are the only things I find myself concerning about when it comes to this app. Everything else is AMAZING but I'd prefer if these features were either added or fixed. I love this! You can record you drawing and add music! But may I suggest being able to use only a certain part of a song as well as the whole song? Like let’s say I wanted to use a song The was three minutes in total, but I only wanted to use 2:31 - 2:53. Could we have the option of that, and the whole song? Thank you, and have a good day. I love this app so much! I definitely recommend it to people who can pay for it. You can draw for fun, record videos on it, and it comes with great tools which is pretty fantastic. Honestly, I love making videos on this app but I have not something wrong with the app, but something I’d like to be added. While recording videos, I notice right after you get a selection of what speed you want it to go at. Though, to be honest, I would like there to be a choice where you could do no speeds and just normal speed. If you add this, it’ll help me a lot, thanks! I downloaded the App and used it a few days until it locked up. I reached out to the developer and they responded immediately. I haven’t heard from them since. No solution and no worries from the developer. SAVE YOUR MONEY find another App. Avoid this one! The Best Art App for the money, hands down! The best money I've ever spent, bar none. I have been on Sketch Club for almost 5 years now, and my art has improved 10 fold ( I'm not art educated, and self trained). The other amazing artists on Sketch Club are just amazing, and I've learned so much from them over the years. Jim Scott, the creator of SC is always keeping it fresh, keeping it running smoothly, and I can't thank him enough. I have become good friends with so many people on D.C., and I wouldn't trade this app for all of the other apps I have combined. If you are a trained artist, a natural, or someone trying to improve your art skills like me, this is the app you want. Big thank you, Jim. Absolutely love SketchClub! Great brushes, tools that are readily available. Everything that one needs to improve their art is here! Love the challenges, compos. There are great artists that are willing to assist new comers in feeling welcome & comfortable! I especially love the fact that your drawing can be "saved" until you have the time to complete it! Thank you so much for developing this app! 11/22/17 Still loving SC! Best art app around! The creator Black Pawn is always open to ideas from Artist’s suggestions. He is quick to fix an occasional bug that may occur. The $2.99 you spend will get you the best drawing app around! Rating it a 5 ⭐️ again! I've used this app for so many professional projects for roughing out ideas for clients and even fully finishing small works with incredible speed thanks to the slick design of this app even on some of my older devices, like my old iPod touch and iPad mini 2. Wanna draw, color or paint, block in color with a superior vector brush, edit and color correct then easily export for easy upload or further editing? This is the one. It’s so user friendly it’s unbelievable compared to so many other apps. Options are easy to get to, brush presets are a breeze and every brush can be used as an eraser. Even better are the online aspects. Wanna upload or browse user made art, textures, brushes and get inspired by other artists? I've never seen an app that compares as favorably with weekly challenges and online help. I love this app. It's so easy to go from simple sketches to fully rendered and painted art in a shockingly short time thanks to an excellent user interface and snappy toolset. The social aspect is icing on the cake, but I'm also grateful for nice export options for archiving my work. Get it, you won't regret it! Happy to say Sketch Club is back on top of my iOS tool kit after the recent update, fixing the Pencil lag introduced with ios11. Great developer and awesome software - particularly the Vector Lasso and procedural filters. The community features are great too, and a good place to see what others are doing with the app. I've been using Sketchclub since 2014. It just gets better and better each update!!! 100% recommend for any/all types of artists!!!! This is my most used, most loved app. It's more than just an app..it's my sanity. And the people using this app have become my family. No matter what walk of life you come from, you become friends with everyone! Everyone encourages you and even though there are competitions, there is never pressure and you never feel like there is a winner or loser! Just really good artists helping one another! This is the digital art with hand! I've been using this app for years, I think I got it as a free Starbucks download a long time ago but I've have since paid for it and I recommended it to anyone looking for a photoshop-like app for their phone. My husband uses the adobe apps but I find sketch app a lot easier to use for fast 'shops' and quick sketches. The only thing I would change is making the text options easier to get a straight line of text but everything else (cutting, blending, drawing, etc) is really intuitive. Update: They fixed the text issue!! I've been drawing with Sketch Club for three years now, and it's improved quite a bit in that time. This app is wonderful and I've already recommended it to several people! Fab!! Great app enhanced by a great community! Best $2.99 you will ever spend! One time purchase buys you all of the extensive tools, brushes, colors and features of this fantastic drawing app. Features like layers and custom brushes and photo editing are comparable to Photoshop, with a user-friendly style. For beginners and pros alike, all ages! Sketch Club is fun too! You get access to the community where friendly help and tech support is instantly available. International, friendly community of artists and chat; live-streaming. Free classes, videos and tutorials from top artists. Fun daily drawing challenges and competitions. You can also export your art in various formats for printing or professional work. If you are unaccustomed to creating digital art, this app is daunting. It was for me. But the more I use it and learn, the more fun and enjoyable it is to use. I've been using it for almost three months now, and am beginning to really love it. The possibilities are endless, the tools are wonderful, and the community is welcoming and amazingly talented. Go for it. You will learn, stretch your mind, meet terrific people, and see amazing art. This is the BEST sketching app EVER; the tools are amazing, and there are so many techniques to take your sketch to the next level (textures, backgrounds, filters and more)! Owner is constantly improving the app and is open to suggestions and readily available if you have a question. The Community of artists is helpful and friendly, and the low cost of $2.99 is SO worth the hours of drawing enjoyment an artist gets! I highly recommend this app to those who love to draw! My "Go To" App on iPhone for quick or serious sketches! Quick, responsive, advanced features, high-resolution capable, layers, deep zooming, lots of brushes. If it's missing anything, I seriously cannot think of what that might be! (Maybe a better gradient tool, one that creates a gradient between any two colors, not just one color and transparency; and a vector tool dad can draw straight lined shapes easier). As a professional digital artist, I've used this app on my iPhone exclusively for some paid jobs, where before I'd always need Painter and/or Photoshop on my desktop. It literally replaces thousands of dollars of high-end software on my computer. Sure, I still need those for very advanced apps, but it's amazing what I can accomplish... effortlessly... with one finger on my iPhone, and this app, with the essential features I usually need. I usually don't write reviews, but felt compelled. I've literally tried dozens and dozens of art/drawing apps, this has to be my favorite. If you want the best, you just found it! This is a wonderful sketch app. - that does everything I want in creating - watercolor, paint, pixels, textured, ink and what ever your mind can come up with! Love that I can make my own brushes, frame with my own design and be able to take it to whatever level of - from an idea to professional presentation I want ! As an artist that has painted in oils, acrylics ,inks and pastels, it is wonderful to have an app. that will mimic the mediums I love and need only the iPad and Sketch Club app.to take with me on trips! I've use this to create posters for art installations. Easy to use and lots of fun. Love it always because there's so much you can do with it. And there are frequent updates. And the developers care about the app and their customers. So, five stars and a big thank you to all of the developers! Just a note: Hopefully, there will not be a subscription in the future. But these days it's difficult to find any app without one. Instead, I'd rather have a Tip Jar, so anyone can give if they can afford it. I would give. Some can not afford a subscription. And for those who love an app, but can not afford a subscription, and do not use that app as often as others do, their subscription fee should be less. I personally do not think it's fair that everyone has to pay a lot of money for an app they love if they do not use it too often, or if they have less data on their cloud, or device. But I guess everything is a give and take, and the company needs the funds to keep going. I think that in the future, our subscriptions will be bunched together and we will be paying one total fee for all the apps we use. But who knows? SketchClub did not glitch for me until I updated it. The update said it would add more things for iOS 11 but now there’s a huge layer glitch that makes it impossible to draw with layers. Great app Am willing to pay for upgrades b/c it’s so good!!! Would you pls do 2 things? 1. Make it easier to contact you 2. Add the ability to easily import/export pad files through iOS built it file system through the sharing feature in iOS? Be happy to pay for that feature. I need it! One of the BEST sketch apps! I absolutely love this app. It's so much better than most other semi-pro and even pro apps. They should charge more for it, it's that good. Best horse in the race! While the brushes may lag a bit behind Procreate in settings to twiddle and having categories to organize them, the shortcuts bar makes this app the drawing/painting standout. Easy-to-configure, pleasure-to-use. Great programme. Excellent tools! If you aren’t in the special clique, it is a painful experience. Great art, poor & painful social skills. Would I recommend it? Yes, if you are a great artist or if you enjoy being disliked. Unfair competitions, unfair everything because of the chronically social strata. Kissing as is a must! I've had this app for a good amount of years now and I would greatly recommend it. The most convenient and advanced drawing app for iPad I have used so far. Recommend for anyone, especially in graphic design industry. I'm a young inspiring artist who's been using this app for years now and personally I cant find anything better. It has much of the functionality of programs such as Photoshop and Paint tool SAI for fraction the cost. If you're an artist, especially if you're a cartoonist, get this app. Its worth every cent!